Today is the eve of the Feast of St. Michael and All Angels, or “Michaelmas.” Michaelmas marks the end of harvest, the beginning of fall and the shortening of days. Linked in both orders, are tossed to and fro. Angels are “free from our bond… free from the weakness and wonder of flesh.” We, however, are “Dumb, in the life of the body confined… Linked in both orders… tossed to and fro.” We are made for another country, to be sure. We are alien creatures on this earth, sensing another home, a home calling us. Each time we respond to goodness, beauty, truth, and love we are touched by this heavenly world. We are pulled. Each time we pray, each time we make the Sign of the Cross, each time we receive the Holy Eucharist, we reach and touch heaven. We are both body and spirit, unlike angels, who are only spirit. We have a foot in each world; we straddle two countries or perhaps toggle between. And it is true, as Father Dearmer says, that our flesh is both weak and wondrous. Today, as cultural forces seek to merge the male and the female, to create androgyny and deny gender, I see this wonder disappearing. Men and women were created to be delightfully complementary to one another; they are uniquely different and yet when joined together they produce new life. So within the sacred union of marriage, God works these miracles, transforms our fleshly weakness into creative strength. He unites heaven and earth through our flesh. 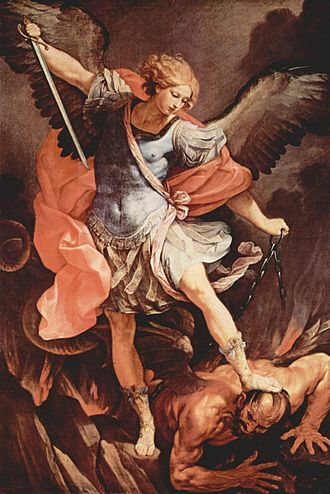 Michael the Archangel is described in Scripture as the great warrior-angel who defeated the rebel angel Lucifer in the war in heaven. And of course there are choirs of angels, angels appearing to comfort and guide as well as protect, messenger angels bridging heaven and earth. There are many accounts of people seeing angels, often testimony of children whose vision is unguarded. I pray for such a wind daily, especially as I work my way through the first draft of my novel-in-progress, The Fire Trail. I know that I cannot write it alone. I need help and, as I reach for help, angels lift up my hands to the heavens, leaving my feet firmly planted on earth. I can feel the stretch of my soul, my mind, my heart, and sometimes it hurts. I pray for such a wind for our nation and those of the Western world, as we fight to defend our boundaries, both of liberty and land, as we build a wide fire trail to keep out those who will burn to ash our way of life, our freedom. I pray for the angels all around us to open our eyes that we may see the truth. And I thank God for Father Dearmer and his dear portrait of our ministering heavenly friends. This entry was posted in Uncategorized and tagged Angels, hymns, michaelmas, Percy Dearmer, prayer, saint michael, writing. Bookmark the permalink. Thanks, Father True… Archangels are of course angels, and the word merely means “chief” angel. Michael is referred thus by St. Paul in Thessalonians. An interesting summary can be found at http://en.wikipedia.org/wiki/Archangel. Dear Christine: As always, a beautifully written piece both inspiring and worthy of meditation. Thank you. Donald True ( retired) PS: Do you know why Michael is an Archangel, and not an angel?